Dear friend...have you found your patience with your brothers and sisters very short? Have their ways annoyed you and their habits made you angry? Have you spoken to them sharply and in a way that you would be mortified to even think of speaking to someone outside the family? The real test of our Christian experience is in how we get along with our family at home -- especially with our brothers and sisters. ...The relationship of the true princess with her brothers and sisters is one of helpfulness, sympathetic understanding, and a sharing and bearing of all their problems and difficulties. ...Tell your brothers and sisters that you appreciate what they do for you. Show by thoughtful actions that you love them. A little girl follows me. For fear she'll go the selfsame way. Whate'er she sees me do, she tries. That little girl who follows me. "A careful boy I want to be, a little brother follows me." 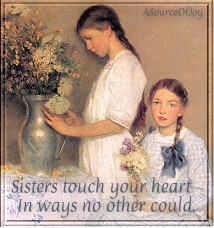 One of the sweetest places a young girl may have in any home is that of big sister. What a field of happiness and usefulness is open to the girl with little brothers and sisters! They are ready to look up to her as a guide and a pattern in everything. If she manages rightly, she can have unlimited influence with them. Have you seen her, the ideal big sister? She is ever ready to kiss away bumps and bruises of little heads and hearts; she knows just how to mend broken dolls and balls; she likes to pop corn and make pancakes for little people to eat; she knows such wonderful stories to tell or read; she will pick up and put out of sight those evidences of childish neglect that might bring little people into trouble; she understands and is a companion for every one of them. Yes, many homes have just such older daughters as that. The girl who is learning day by day to be a good daughter at home and a good sister to the younger children is also learning day by day how to eventually be a good wife and mother. She is getting ready for one of the greatest works a woman can do. Making a good, true home for somebody is a truly beautiful profession. We should be as courteous and thoughtful of our brothers and sisters as we are of our friends. So often our best manners are for...company, but, in actuality, our very best manners should be for those of our own household. Begin now to show your love and care for your brothers and sisters. Brighten their lives with acts of kindness.